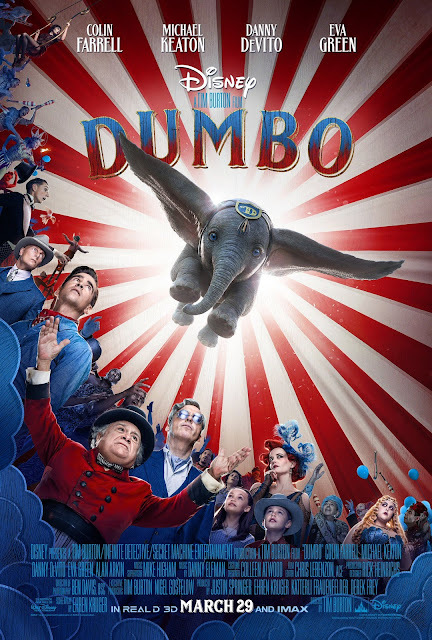 Will you believe an elephant can fly well in Tim Burton's version of this movie you will see Dumbo fly way to frequently. With this live action version of Dumbo being an ode of love for Mr Burton who has wanted for years to make this movie, and this being the least looking Tim Burton movie he has ever made. The problem with this movie although looking absolutely gorgeous is it isn't very good, in fact all kudos has to go to the trailer editor making a better film in trailer form than the actual film itself. A film that does plod along that allows the titular character to find his wings far too early, to once again be exploited by big business and big bucks. It was always going to be hard task to take a forty minute cartoon film and turn into a two hour film, meaning more character development, more plotting, and a hell of a lot of filler to make this the biggest disappointment of the year, and Aladdin hasn't even been released yet. The acting in it does save the film a little, with outstanding acting by Michael Keaton, and Danny Devito reuniting onscreen again, since Batman Returns also by Burton, Colin Farrell is OK the same as Eva Green, and the child actors are decent but something isn't quite right with this movie and it is hard to pinpoint why it doesn't work. The CGI Dumbo is perfect all gooey blue eyes and full of cuteness and caramel undertones, you almost shed a tear every time he takes flight, but this is all too frequent and it becomes " oh he's flying again" instead of a jaw dropping reveal at the very end which this film was crying out for, with a disappointing non final third to boot is the reason this movie doesn't quite work, and it disappoints me to say that.